L’Instant D’Un Été is a new limited edition of Guerlain’s “star fragrance”, L’Instant. It is a “lighter and luminous version”, which adds “un soupçon d’agrumes” (grapefruit and bitter orange) and not much more to the composition of the original scent. It is no secret to anyone that I am a big fan of Maurice Roucel, the creator of L’Instant The First, so it pains me to say that I do not like L’Instant as much as I would have liked too. I think the magnolia note is lovely in there, but I find the scent to be too sweet and somehow indistinct. I was unable to find information regarding the nose responsible for L’Instant D’Un Été and I hope that it was not Roucel, because I liked the summer version even less than the original. I understand the reason behind making the fragrance more citrus-heavy for summer, I for one always crave citrus scents during that season…But something just does not work in L’Instant D’Un Été…I would have loved it if the grapefruit and the magnolia co-existed here in a perfect balance, but they do not. The sharp, awkward grapefruit note keeps sticking out and I find it rather bothersome. The scent is also quite sweet, the citrus and the florals are accompanied by a large helping of ubiquitous vanilla… L’Instant D’Un Été smells to me like a pink, bright, vanillic, girly offspring of L’Instant and Yves Saint Laurent’s Baby Doll (or Anna Sui’s Dolly Girl or any other “luminous”, pink grapefruit scent). In other words it smells like every other fragrance on the market. In a blind sniffing test, I dare anyone to be able to tell L’Instant D’Un Été apart from other scents just like it. As an aside note, if I had to choose a (feminine) L’Instant to wear, I would have opted for L’Instant Eau de Noel with its delightful iris note and a candied, but a little less sweet, feel. However, Eau de Noel too suffers from an overabundance of vanilla, which to me smells a little caramel-like and even a little burnt in the drydown. I liked L’Instant D’Un Été Pour Homme much more than its feminine counterpart. Again, the summery effect here is achieved by adding more citrus (in this case, lime) to the blend. Apart from that, L’Instant D’Un Été Pour Homme stays pretty true to the original composition and is immediately recognizable as a close, albeit less intense relation of L’Instant Pour Homme. The lime note makes the perfume fresher and lighter yet it does not rob it from the lovely sweet anise note. I am decidedly not a lover of anise, but I enjoy it in the masculine L’Instants. The original version has always reminded me of pizzella, Italian anise cookies, and some of that vague, softly-gourmand quality remains in the summer version. The only part of L’Instant D’Un Été Pour Homme I did not like was the drydown, which on me consisted of patchouli and nothing but patchouli. It was as if the subtle and pleasant development of the fragrance came to a sudden stop, and for the next five-six hours all that remained from L’Instant D’Un Été Pour Homme was patchouli. I did not find the note off-putting per se, but I though the drydown was quite simplistic and boring and therefore a letdown. The regular L’Instant Pour Homme remains my favorite L’Instant and I am very curious to try its Extrême version. I do not know when the summer editions will be available in the States. The only online place where I was actually able to find L’Instant D’Un Été and L’Instant D’Un Été Pour Homme was Marionnaud.ch, where 80ml of the women’s version and 125ml of the men’s retailed for CHF 68.90. I am glad that you mentioned the patchouli mono-dimensional sneaking out (well, my words). 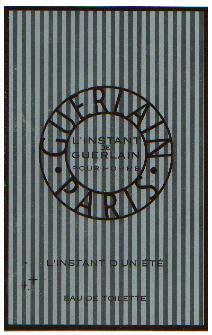 Although ab big, big Guerlain fan, I must admit that the pour homme was and still is disappointing on my skin. The development of the fragrance is for me just not balanced, there is a story missing after a (admitedly lovely start). Somehow it never worked on me, but I get some woods besides patchouli.Let's hope the extreme version does not mean extreme patchouli? I always have a problem with vanilla - and vanillesque arrangements. I really like vanilla, stood alone - in food or even toiletries - but it never works for me in perfume. 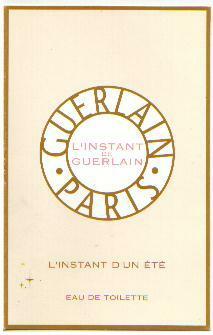 There has been very little in the Guerlain stable I really find inspiring these days. Just more mundane stuff from the sounds of your descriptions.I'll pass but thank you for writing anyway! No pee note in this one thankfully (and I know exactly what you mean about Pamplelune, that scent is of those that are truly vile on me :-( ) The grapefruit in D'Un Ete made me think of YSL Baby Doll,that kind of grilie, citrusy, sparkling little thing. L'Instant (and its various flavors) for women have never thrilled me, so I've still not tried Pour Homme. A blog commenter recommended it last week, so I will fix that oversight; it sounds like something I might really like, although Andy's comments worry me a little. I quite like the orginal L'Instant. I may be just lucky that it is not All About Patchouli on me in the drydown. Like in the summer version. In any case, the beginning is truly lovely, so it is worth trying just for that. Mmm, I'm wearing L'Instant today. I found that L'Instant PH's life on the skin pretty much depends on the wearer's skin type. On me it's scrumptious (anise&citrus give a feel of jasmine-scented black tea with a generous dollop of honey) and in the deep dry down (takes a lot to fully develop) it's only slightly foody and powdery, with dry patchouli taking centre stage, albeit inoffensively, and imparts elegance to the composition. In a word - remarkable. Sorry for the long post, I'm terribly partial to LPH :-). I agree that L'Instant PH is quite remarkable. It actualy changes on my own skin from wearing to wearing. Often it is slightly gourmand, sometimes it is much drier, sometimes patchouli is more prominent than usual. It is certainly my favorite among all L'Instant versions. I like, but do not love L'Instant, although the masculine version is much more interesting. The summer versions are almost always more boring takes on the original, therefore I did not apply any effort in seeking these out. You are absolutely right. They are not worth it. I wish that darn Extreme version would get here already! I also like the men's much better than the women's, and am interested to see what they'll do with the Extreme. I am not a fan of L'Instant in any of its incarnations (only the Noel version was somewhat more tolerable). I found it extremely heavy and cloying. I guess this one isn't going to change my opinion! Sad that Guerlain pushes this fragrance so hard when they have so many classics. P.S. - If you're looking for an interesting fragrance with some vanilla, I would recommend "Josephine" by Rance. VERY unusual stuff.